In an earlier blogpost we wrote about GDPR and our expertise. 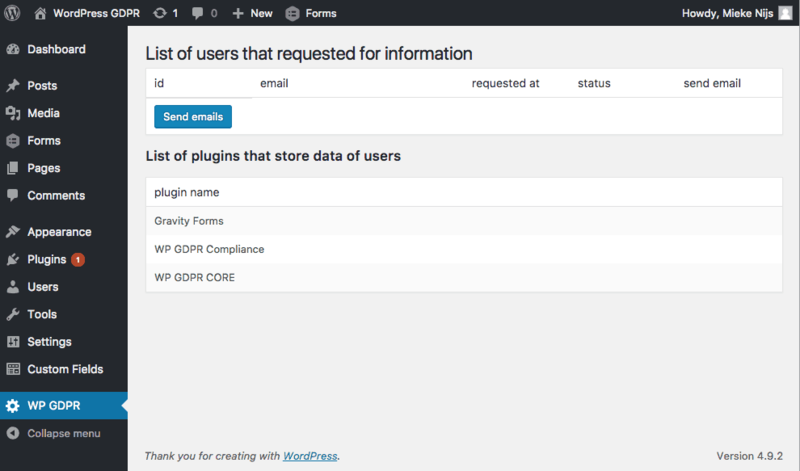 In the meantime, we took action and created a plugin to make WordPress websites GDPR-ready. We have a lot of clients using comments and forms on their website, from a contact-form to a shipping-form or an application form. All these sites need to adjust their content to be compliant with the new General Data Protection Regulation. Because most clients have the same issues, we decided to make a plugin which makes it easy to implement the changes in all websites. And, since we want to contribute to the community, we decided to make it publicly available on the WordPress plugin repository. Our plugin gives visitors the ability to view (Art. 15 GDPR – Right of access by the data subject), edit (Art. 16 GDPRRight to rectification), request to delete (Art. 17 GDPRRight to erasure (‘right to be forgotten’) or download (Art. 20 GDPRRight to data portability) their personal data. 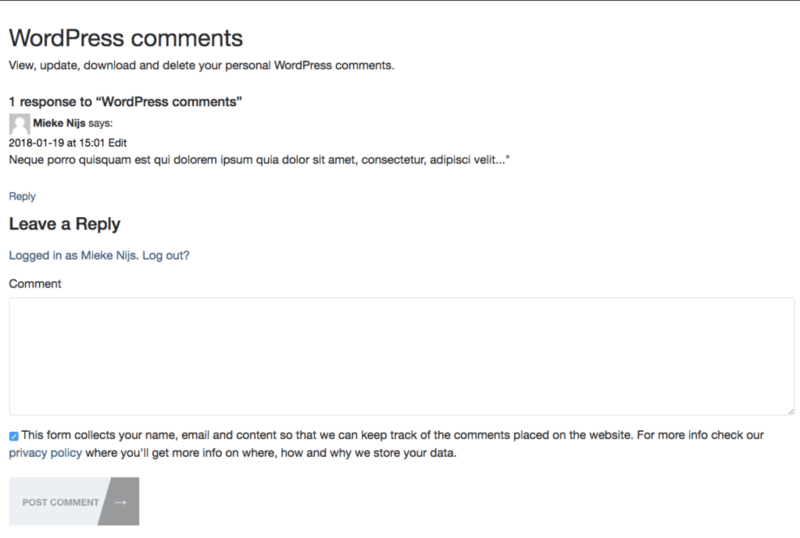 It adds a checkbox to the comment-form to ask permission to store the data. You can use the default text or implement your own. 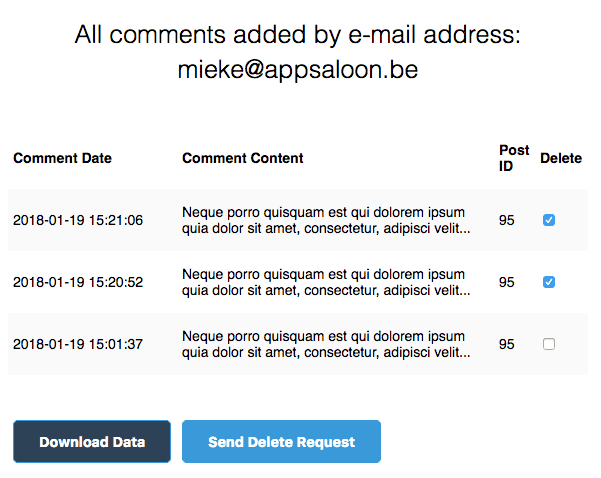 It creates a page where users can request access to their personal data created through WordPress comments, stored on your website. 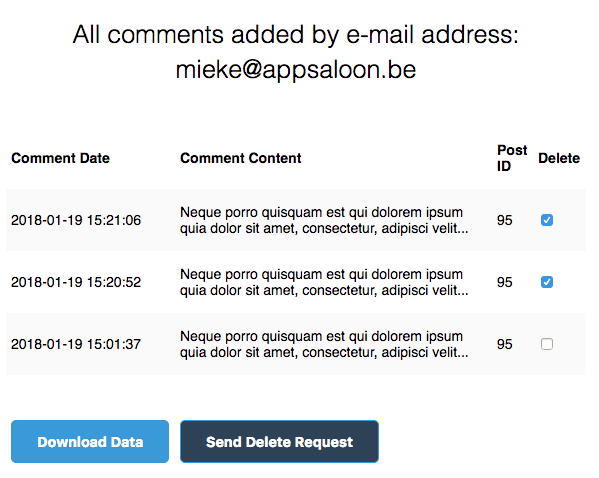 When a request is sent, the user will receive a mail with a unique url on which he can view his comments. Per comment he can ask to delete the content. This request will trigger a mail sent to the admin who can decide whether to delete the comment or make it anonymous. 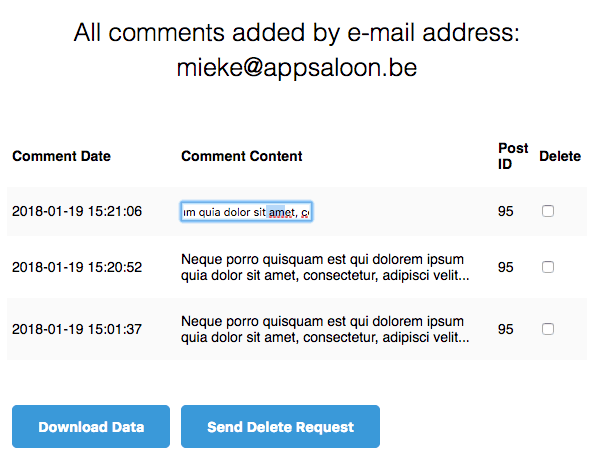 The administrator can edit or delete these comments through the backend of our wp-gdpr plugin, where he has an overview of all requests and a list of the plugins that obtain personal data. In the following weeks we will create add-ons for Contactform 7, Gravity forms, Woocommerce and the Events manager. All these add-ons will have the same features as listed above. When you want to integrate these features for an other WordPress plugin you can simply send a request so we can add it to our roadmap and create an add-on for this as well. 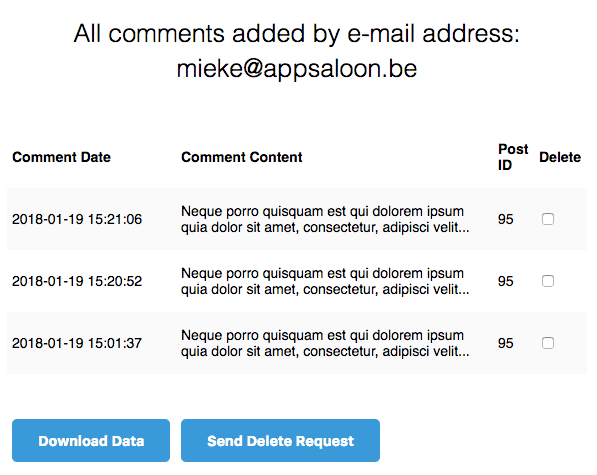 More info about the plugin can be found here: https://wp-gdpr.eu. Is possible buy with paypal? Yes, it’s perfectly possible to pay with paypal.